This is the four part series of pilgrimage of Holy Mount Kailash, adobe of Lord Shiva and Holy Lake Mansarovar, formed from the mind of Lord Brahma. The video of spiritual journey (yatra) is 59:18 mins long and is split up into 4 parts each of 14:58 mins, except for the last part of duration 14:30 mins. Yatra was done by Shri Pankaj T Mavani. Video begins with an Invocation to Lord Ganesh, Lord of remover of Obstacles followed by prayer to Shri Ramakrishna Paramhansa, the source of Inspiration of Shri Pankaj ji. 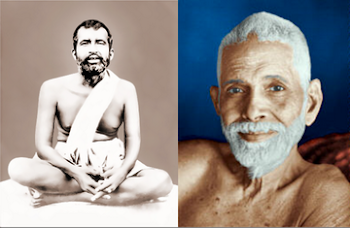 Another photo shown in video is of Sri Ramana Maharshi, whom Shri Pankaj ji greatly respects and offers his gratitude. Then comes snaps of Holy mountain Mount Kailash, the adobe of Lord Shiva and Holy lake Mansarovar along with English narration. Narration by Shri Pankaj ji is in Gujarati. Unfortunately, Pankaj ji's voice is only audible in Left speaker and so it is not as high as English narration. Actual video starts after 03:03 mins. Video shooting of Shri Kailash Mansarovar Yatra was begun from Mumbai on 30th July 2009 and ends in Chennai on 13th August 2009. As per Indian Tradition, holy yatra is started with an Invocation. Invocation is done in front of OM by Shri Pankaj T Mavani, around whom this video focuses. Shri Pankaj ji had made a firm decision to complete the entire Yatra bare footed with only one pair of clothes (one shirt and one pant), without the use of any kind of warm clothes / jacket. During most of the journey, he was bare footed and without any warm clothes, but upon a very emotional request of his guide, he accepted to wear a warm jacket and accept oxygen bag for a short period as the guide was very concerned about Pankaj ji, since there are many deaths due to extreme cold and lack of oxygen, Mount Kailash and Lake Mansarovar is located at great heights in the Himalayas, specially in the region where Shri Pankaj ji is seen wearing warm clothes. It is unconditional surrender and strong faith in Almight God that has made it possible for Shri Pankaj ji to complete this holy Yatra, fulfilling his dream after 40 years. It takes 3 days to complete the Parikrama (circumbarence – moving in circular path along the foot of hill / mountain or in general anything) of Holy Kailash, which Shri Pankaj ji completed bare footed without any warm clothes and with one pair of clothes, which he wore from home. Due to conservative nature of Shri Pankaj ji, he did not allowed anyone to upload this video. But after several requests since 2009, finally, he agreed to upload this video. We hope that this video serves dual purpose of showing Yatra and being instrumental in giving us inner strength and establishing strong faith in God. Many people think that Shri Pankaj ji could do this Yarta, the way he dis, sue to his strong mind and firm determination. But I have a different opinion. It is the faith and complete surrender in God that has made it possible and not limited mind power of a mortal. Faith is Life, Doubt is Death. This video demonstrates the strength of faith in God. God is ready to protect us, our body and our belongings if one unconditionally surrenders and has strong faith. Similar updesha (spiritual Instruction) is given in Bhagavad Gita too. Not exaggerating, I feel, Shri Pankaj ji is a living example of this updesha (a kind of promise) given by Bhagawan Shri Krishna and a source of inspiration for us. Surely action speaks louder than works. I feel greatly honoured and feel that God's grace has descended upon he as I am allowed to upload this video from the account of Indiaspirituality. As I am typing this intro, I am feeling blessed, filled with bliss and peace. We are not professionals. The video is shooted by a non professional and so it is not of professional quality. We will also update the info as and when we feel to add / remove / modify anything. We are working on building a timeline and as much details as possible. This video is solely for non-commercial purpose. We are not earning anything, nor we intend to in future. It is purely uploaded as a source of information and inspiration. We are not familiar with uploading on internet. We have tried our best to provide you a better quality. The resolution is 4:3 and not HD i.e. 16:9. Hence you will see vertical black bars in YouTube video. Converting it to 16:9 HD, the video gets stretched. Many thanks to @ebbixx for wholehearted support in YouTube support forums. We would also like to thank @gbcali for his / her advices. Both are top contributors at YouTube support Forums. We would also like to thank all those who made this video possible. Videos uploaded on YouTube are published under 'Standard YouTube License'. mansarovar, kailash, spiritual, pilgrimage, yatra "Lake Manasarovar (Lake)"